Don’t tell Nick Lanzi what he doesn’t know. Don’t tell the new Vestavia Hills High School graduate what he can’t know.Because he knows better. When doctors diagnosed Lanzi with Down syndrome when he was just a few days old, they told his parents he would never have intelligence surpassing that of a 3-year-old. But when his 11th-grade American-history teacher passed him a copy of a test made specifically for “special needs” students, he asked for a “real” test instead. He took it. He made a 96, the highest grade in the class. He made his parents, his teacher and everybody in the class proud. Lanzi knows he is different. He just knows a different kind of different. Lanzi, 19, is part of the first generation of special-needs students, including many graduating this spring, who have been taught in regular classrooms their entire time in school. Inclusion is a practice in which mentally or physically disabled students spend most or all of their time learning alongside typical students. Inclusion is a still-growing concept — one that’s been around since the 1970s, but became the norm only in the mid-1990s, advocates say. Research has shown that most physically and mentally disabled students do better academically and socially when with peers. Segregating a child from a regular classroom, research shows, may do nothing but harm the child’s self-esteem and hinder the learning process. Advocates contend that children with disabilities can be successfully educated in regular classroom settings if the right aides and supplemental services are provided. Special-needs students are placed in what is called an Individualized Education Program. It includes a written statement of special education and related services the child will need in order to be properly educated, as well as any modifications to the regular curriculum. Inclusion, advocates say, allows students with physical and mental disabilities to experience all aspects of regular school life. If Lanzi is a measure, the process works. Everyone at Vestavia Hills, it seems, knows Lanzi. During his four years of high school, he would walk the halls between classes high-fiving friends. He was inducted into the Student Government Association and was named Most Admired by his peers for Who’s Who among his senior class. 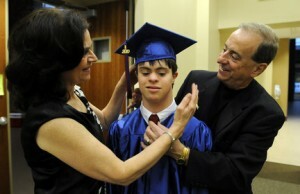 The story is much the same for Whitley Means Ware, a 20-year-old with Down syndrome who graduated from Carver High School on Tuesday night. Not only was she in the regular classroom, allowing her to make friends and learn from her peers, but she was on the varsity cheerleading squad the last two years of high school. That’s not to say that inclusion always works. It is up to parents and school administrators whether they want their child in a regular classroom setting or to be segregated in a special-education classroom. Many special-needs children do both. Still, many schools simply place special-needs children in the back of a regular classroom and give them “baby work,” says Deborah Mattison, a Birmingham lawyer who specializes in special education and disabilities. When implemented correctly, she said, inclusion works. The social skills alone, she said, are invaluable. Special education has come a long way since the federal Education for All Handicapped Children Act was passed in 1975. Prior to that law, students with special needs were frequently not allowed to enroll in public school. The law was reauthorized over the years and was renamed the Individuals with Disabilities Education Act. Segregating special-needs children into separate classrooms or schools was common then, Ellis said. But that began to change in the 1990s, when research began showing benefits to inclusion. While there still are children in segregated classrooms, inclusion is becoming the norm, especially since the No Child Left Behind law was enacted in 2001, Mattison said. That law states that all children must be educated by highly qualified teachers and requires all students — regardless of their disabilities — to meet state goals on standardized tests. That caused school systems throughout the country to turn their attention to children with disabilities, by developing and implementing strategies to move those students forward academically. This entry was posted on Saturday, July 24th, 2010 at 3:03 pm	and is filed under Inclusion. You can follow any responses to this entry through the RSS 2.0 feed. You can leave a response, or trackback from your own site.